One of my more interesting experiences from my home-viewing days, when the credo was "I’LL WATCH ANYTHING THAT MOVES, HEHEHE!!!" (you have to say it like Dennis Hopper as Frank Booth) was my popping into the VCR a very unpromising VHS action flick, barely distributed, entitled SOUL PATROL…and beholding that, in fact, it was a truly exotic import, a “blaxploitation” retitling of a bona fide 1970s South African crime flick, DEATH OF A SNOW MAN. Nothing on the box gave away that this was a shot-under- Apartheid production set in Johannesburg and the infamous Soweto townships, about the alliance between a white police detective and a crusading black newspaperman investigating a vigilante group. Great cinema? I dunno, maybe if you were Quentin Tarentino (he’d especially like the ending, when the cosmopolitan reporter most symbolically hurls a spear through the main bad guy). For me the thrill was the lens into South African urban life at ground level, not filtered through the big-budget lens of a Hollywood dramatization, like CRY FREEDOM or INVICTUS. This isn’t stuff one sees every day. 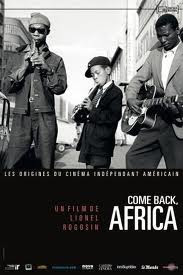 There’s a similar sense of discovery in COME BACK AFRICA, Lionel Rogosin’s 1959 docu-drama recently restored and being presented on the big screen. Background knowledge is crucial: Rogosin (1924-2000) was an American filmmaking novice who, in the mid-50s, camped out with his miniscule 16mm camera crew in the mean streets of New York City and came away with ON THE BOWERY, a total immersion among the down-and-out alcoholics of the city. Sure, Rogosin marched his homeless cast of non-actors through a very loose, imposed plotline and staged the big bar brawl. But everything that happened was straight-on, honest, and true to life, and some gave ON THE BOWERY respect as one of the best American documentary achievements, or film achievement of any sort, for the decade. COME BACK AFRICA was Rogosin’s lesser-known encore. I’d love to see a DVD version with commentary to hear the full story about how he pulled it off, but it seems that the activist-filmmaker’s MO was very close to ON THE BOWERY: Rogosin entered Johannesburg and restricted areas with a small crew and filmed his movie among sympathetic locals without permission, to give the outside world an uncensored look into the contemporary life of South Africa’s disenfranchised natives. COME BACK AFRICA is not entirely a hidden-camera piece; there are in fact a couple of J-Burg crowd scenes (most of street musicians), and whites are plainly noticing the camera running. Some are curious - and some noticeably back off. Did a guilty conscience make them want no part of this? Or did they just know the ACE VENTURA sequels would eventually come to Africa as well? COME BACK AFRICA also has a much more obviously fabricated storyline than ON THE BOWERY, complete with a tuneful walk-on cameo by vocalist Miriam Makeba (young and gorgeous before her three decades of international exile fighting the Apartheid regime and publicizing native African music alongside Harry Belafonte). But even with that, the narrative still gives you a feel of standing in terra incognita – crisp shots of Johannesburg looking as bustling and big as any prosperous 1950s American metropolis. And the South African movie marquee shows that the attraction is that old TV creature-feature standby FIEND WITHOUT A FACE, dig it! whisky-swilling Boer wife and her slightly more enlightened husband; it’s Zachariah’s first-ever time he beholds his reflection in a proper mirror. He loses the job, and several more, but makes friends among fellow blacks and even marries a girl and fathers a child. Yet even when he gets seemingly stable work helping out at a white restaurant (significantly, the sympathetic mom-and-pop owners are Jewish), the poor guy is let go when a racist patron has a fit at the sight of him. Things go downhill from there, to an abrupt and tragic fadeout. Acting is amateurish, sure, and the downbeat storyline just sort of drifts along. But a movie like this, at least for me, commands attention through its very singular nature and makes one look past the shortcomings for some real socio-artistic gold. In one scene Zachary and his cronies debate politics, and, if you can decipher it through the thick accent, one of them voices the same concerns about native Africans in the 1950s that you’re hearing in election debates in 2012, - that the “liberals” who claim to want to help so much are just interested in keeping the black man dependent on handouts and not self-sufficient or empowered. Wow, if the South African police didn't torture him to death as a "communist," find that guy and give him an AM talk-radio show. And as an undocumented alien, Fox can pay him next to nothing, too.